Robert Erickson: I came here in the spring of 1970 with Gary Snyder and Masa and their two sons and we camped out on property south of North Columbia on their property. I was here to help with the building of their house. NCSCC: So you were woodworking at that time? Robert Erickson: I was beginning to learn about woodworking. 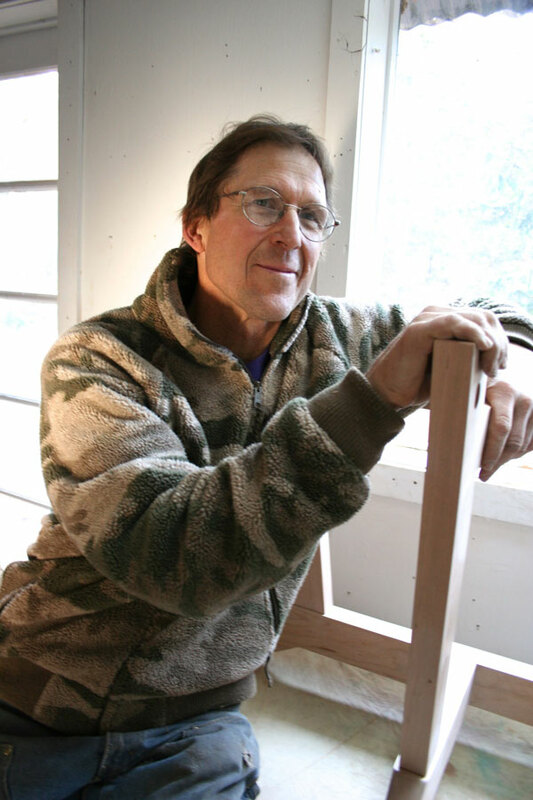 I had done – I was a year out of college and I had been doing woodworking and learning furniture making with a couple of furniture makers who were neighbors to where Gary Snyder was living in Mill Valley, outside of Mill Valley. NCSCC: Were you also from Mill Valley? Robert Erickson: No, I grew up in Nebraska and I went to the University of Nebraska and I moved out here in 1969, the summer of 1969 and found this enclave of woodworkers, two woodworkers outside of Muir Woods and they allowed me to build a camper and I kind of camped out there and then I ended up eating with two of the people, Marco St. James and Roger Summers who were sort of local Bay Area colorful characters, and I didn’t realize I was in kind of a very unusual bohemian community with Alan Watts next door and Gary Snyder and all the characters. It was a very fresh experience for me. NCSCC: And so did Gary invite you up or did you invite yourself up? Robert Erickson: He invited me to come up, and he presented it. It was very clearly going to be kind of an interesting social experience as well as opportunity to work on a hand-made, handcrafted house. So the combination of young people, a group of young people working together, living together, I had some experience of doing that in college. So it looked interesting and that was a very fascinating project of the Haida combination – the architecture was going to be a combination of a post and beam, a pole house in the Haida style, sort of married to Japanese country architecture. NCSCC: What was going to be your role? Robert Erickson: I was going to be a laborer, a carpenter. I guess I was more experienced than most of the other people, and I had just bought a brand new Nissan Datsun pickup for $1800 and so I had the vehicle that would transport food and supplies and materials back and forth to town. So I had an additional advantage of being hired for that job. It was primarily a volunteer project but we got paid. I think most people got paid $125 a month plus room and board, room was of course the meadow of Kitkitdizze and I got paid $200 because I had an extra expense of a monthly car payment or something like that. Or maybe it was $250, I don’t know. So yeah, that was a very interesting summer. Lou Welch who I had met that spring told me – he was the poet – he told me well, this’ll be a summer that you’ll never forget. And three years later he was up here and killed himself some place on the Ridge. Robert Erickson: I think (the management of the ‘Inimim forest) builds upon the idea that this is something that we all own. Also, it is a community process and it demands maintenance. So the ‘Inimim forest is a BLM property of approximately 1,800 acres that is being co-managed with the Yuba watershed Institute and the Bureau of Land Management. And so there’s a community ownership of that process. It’s not ownership of the forest and it’s not locked in as to what it is. It’s entirely alive and without the maintenance and without the social interaction and relationship with the people who are the staff of the BLM, that thing will disappear. It doesn’t have a life of its own. And so, you know, most of us are old people who have worked on making it what it is right now, but there are other people who will step forward I hope and make it what it will be in the future. The goals and ideals are that it is a place for maintaining, restoring, and conserving an old growth component on the San Juan Ridge. It is not just preservation of what is there now but it is also a commitment to high-quality timber products eventually and whatever other things can come out of the woods that will help maintain some component of an economic base for the San Juan Ridge. So it’s living with, engaged with, part of our economic system here and relationship with the federal government. We’re in the second generation of staff in the BLM that have now come in and it’s a whole new world. New, younger people and very few of the old guard are still around. Dean Swickard who was the kind of creative person in the beginning, he retired and so we have a new person. So, we had to develop a whole new relationship with him. But it was started around 1990, and the goals and ideals once again are to maintain biodiversity, establish old growth component as part of the landscape mix of forest types on the San Juan Ridge and to perhaps engage the forest service and other private land owners to cooperate and see how the landscape of the San Juan Ridge can be better connected and be maintained as a pretty connected habitat ecologically. And it’s gone through many different board members, the Yuba Watershed Institute. But the things we have done on the San Juan Ridge, I see them as three kind of products. One is the ‘Inimim forest. Second is an educational program series that is ongoing and it changes, everything from philosophical deep ecology to identification of lichens and mushrooms and insects and so forth. And that… some of those, they take place in Nevada City. So it’s not just a San Juan Ridge thing. And the third thing is Tree Rings, which is kind of a literary component, people trying to articulate ideals of now and things we’ve learned and just stories but in a written format. That’s the Yuba Watershed Institute I think in a nutshell.